Olivia Colman, Mahershala Ali, and Rami Malek join a long list. The Academy Awards have a history of giving straight, cis actors Oscars for playing LGBTQ+ characters. 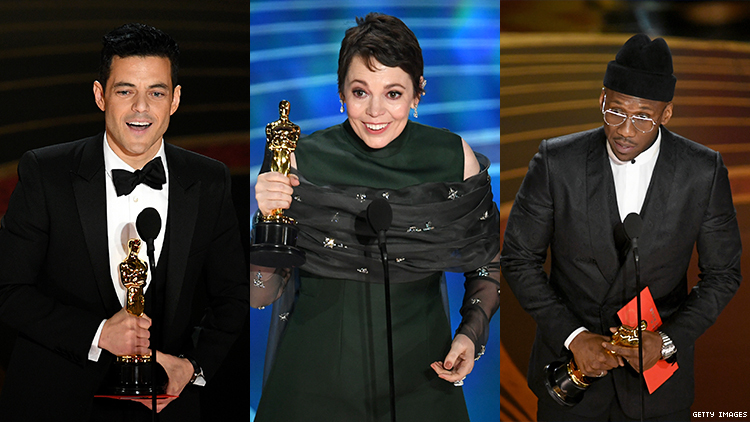 Sunday night, they continued that trend awarding Olivia Colman, Mahershala Ali, and Rami Malek with top acting awards for their respective roles in The Favourite, Green Book, and Bohemian Rhapsody. They join the likes of Jared Leto (Dallas Buyers Club), Natalie Portman (Black Swan), Sean Penn (Milk), Charlize Theron (Monster), Tom Hanks (Philadelphia), and Hilary Swank (Boys Don’t Cry). In The Favourite, Colman played an English monarch at the center of a love triangle with two female members of her court (Oscar nominees Rachel Weisz and Emma Stone). In Green Book, Ali played Dr. Donald Shirley, a real-life Black queer classical pianist who employs a racist bouncer to drive him through a Jim Crow-era South. In Bohemian Rhapsody, Malek played Queen frontman and queer legend Freddie Mercury in the story about the group’s rise to fame. Both Ali and Malek’s Ali recognized the real-life men they portrayed. Malek honored Mercury’s legacy saying, “We made a film about a gay man, an immigrant, who lived his life just unapologetically himself. He said that this victory is “proof that we’re longing for stories like this.” While Malek did make mention of Mercury’s queer identity, Freddie Mercury was bisexual. Though 2018 was a landmark year for LGBTQ+ representation and storytelling on the big screen — from the examples listed above to Love, Simon and Can You Ever Forgive Me? — most of the projects didn’t cast queer people in these roles. Maybe 2019 will be different.